And the list goes on! No matter who speaks up in the group, always find something you can affirm in them. Be an encourager, not someone who inadvertently discourages group members from sharing their thoughts. 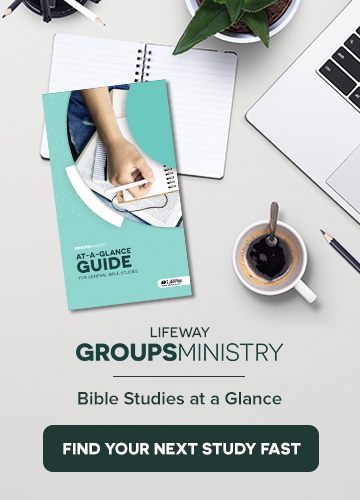 Ken Braddy manages LifeWay’s Ongoing Bible studies, leads a Bible study group, and blogs about groups at kenbraddy.com. The topic of our discussion revolved around a term I’d heard thrown around a few times over the past couple of years—discipleship groups (or D-Groups, for the microwave generation). They’re a growing trend in the church today, one that involves discipleship in a more intimate setting. So what are they? And why should you consider starting them at your church? My group meets once per week for an hour or so over the course of a twelve-month period. Each week we discuss a passage of Scripture we’ve chosen to focus on reading the week leading up to the group time. We respond on what we call a H.E.A.R. worksheet. We also use the F260 reading plan found in YouVersion. F260 is short for Foundations260, a Replicate Ministries resource that focuses on the 260 most important passages of Scripture in the Bible. Another resource worth exploring is the Daily Discipleship Guide from LifeWay. It’s a brand-new resource that I have found to be extremely thorough and engaging. It keeps you in the Word daily and challenges your spiritual development. We also make it a priority to spend a good amount of time fervently praying together as a group. So why should you consider starting discipleship groups at your church? Here are two reasons. 1. Discipleship groups are relational. We all desire and need community. It’s how we grow more mature as believers. D-Groups are small, no more than four or five individuals. Men with men. Women with women. The men in my D-Group are men I knew prior to starting the group, but my relationship with them was surface level. Being together in community has strengthened our relationship. After eleven months of meeting with these men once a week, they’re my three closest friends. Discipleship is relational. Not only has my relationship with these men strengthened, but my relationship with Christ has become much stronger as well. I’m in the Word every day, and I’m held accountable by three men who are in the Word daily as well. I have felt the Spirit move in me over the last eleven months more than I have in my whole life. 2. Discipleship groups are replicable. Next month, my current D-Group will meet for the last time. I won’t stop having a weekly D-Group though. I’ll start a new one. I’ll invite three new men to join the group I lead for the next year. I’ll start reading the F260 plan again, but it’s likely the three guys in my group will be going through it for the first time. I hope the Spirit will work through me to help them become more mature in their faith so in another year they can start their own D-Groups. After all, Jesus tells us in Matthew 28:19, “Go into all the world…” We must obey that command to make disciples of all nations. Discipleship groups are a great place to see your faith in Him become more mature. They’re a great place for us to become disciple-makers, and they’re a great place for us to be held accountable by other godly men as we walk closer with Christ. Please join me in prayer as I consider who the Lord is leading me talk to as I form my next D-Group. In her book Grit, Angela Duckworth discusses the importance of what she calls “deliberate practice” (see pages 120 and following; Duckworth borrows the term from Anders Ericsson). She tells of Olympic athletes, accomplished musicians, and skilled artisans participating in deliberate practice, usually doing one basic thing better than they did it the day before. She notes that this deliberate practice propels these people to be the best in their fields. Fine-tuning the basics deliberately is what makes us better today than we were yesterday. How does this relate to Bible study? In Arthur Flake’s journal, on the page where he outlined the steps for growing a Sunday School, in big letters and underlined are the words “All need it….all need to study the Bible.” Mr. Flake didn’t explain why that was true in 1920; he simply knew that being a part of a regular Bible study group was important for both the unchurched and the senior saint. In Brad Waggoner’s The Shape of Faith to Come (2008), he identified the daily discipline of reading the Bible (Waggoner calls it “daily Bible engagement”) as the number one predictor of a person’s spiritual growth. Think about the different parts of this discovery. Daily: Implies a discipline much like exercising, brushing teeth, or eating a certain number of calories EVERY day. Marathon runners train even in the cold. Should we be any different when it comes to our spiritual training? Bible: Values God’s Word, not the thoughts of great philosophers, leaders, or theologians. The ideas of others can be helpful, but they must not replace God’s Word. Engagement: Implies participation in the act of reading, studying, and reflecting on His Word. Synonyms include engrossed, immersed, captivated by, wrapped up in. In the new Daily Discipleship Guide, some of the Bible commentary is organized into daily segments. Bible commentary is provided for the group time (including the key words feature) that gives a building block for the following week. A Bible passage, directions for reading that passage, Bible explanation, and a reflection question are provided for each of the five days that follow each group time. These daily engagements will take the group deeper into the passage and connect to insights gained in the group time. Learn more and preview four free sessions of the new Explore the Bible: Daily Discipleship Guide at lifeway.com/exploredaily. This article was originally posted on the Explore the Bible blog. Warmer weather. Rain showers. Sunshine. Blooming flowers. Daylight savings time. Green grass. Baseball! Each of these reminds me that spring is here, winter is over, and summer is just around the corner. It’s also time for me, a Bible study group leader, to encourage my group members to think about investing their time and energy into mission projects that meet people’s needs in our community. As we serve others, we reflect the heart of our missional God who reached out to us to meet our needs in Christ. The first-century church heard the words of Acts 1:8 that declare, “You will be my witnesses in Jerusalem, in all Judea and Samaria, and to the end of the earth.” The early church became a missional church, and today we study and serve together with fellow Christians as a way to encourage one another to “love and good works” (Heb. 10:24). As my adult Bible study group gathers for study, fellowship, prayer, and ministry, I want to help them focus outwardly. The natural tendency for any group is to turn inward over time. As a group leader, I can lead my people to be on mission this spring by leading them to become engaged in one or more of the following mission projects. Affirm Public Servants. Men and women who serve our communities as first-responders often place their lives on the line daily, yet with little recognition for their service and bravery. A mission project that affirms public servants is a great way to say “thank you” to these men and women while sharing the love of Christ. Filling goodie bags with healthy snacks, drinks, and small gifts help these public servants know they are appreciated and prayed for by the members of your group. Pick a fire station, police sub-station, or other type of public servant gathering place and adopt it this spring. Maintain Lawns. Target a neighborhood and go with the necessary equipment to blitz several families’ yards (with their permission, of course!) Spring months are growing months for grass and weeds, and some people (elderly, poor, those recovering from surgery, etc.) may not be able to keep up with the demands of a growing lawn. Picking up branches, mowing inclines, pulling weeds out of flowerbeds, and other projects will be a natural encouragement to homeowners. Spend some time before and after getting to know the people, praying for them, and encouraging them. Host a Baby Shower for an Unwed Mother. Partner with your local crisis pregnancy center to provide a baby shower for a mom in need. An unplanned pregnancy can be a scary thing, and your group could show the love of Christ to an unwed mother. Be that unexpected blessing that turns her heart toward God! Use your creativity—there are many more ways for you to be on mission this spring in your community! All Scripture quotations are from the Christian Standard Bible®, Copyright © 2017 by Holman Bible Publishers. You don’t have to choose between accuracy and readability with The Christian Standard Bible (CSB). Find out more at CSBible.com. SUMMARY: In this episode, Brian and Chris speak with Allen White about his new book, Exponential Groups: Unleashing Your Church’s Potential, and the importance of increasing the percentage of church members who are not only involved in a group Bible study but are also involved in leading group study. Allen discusses his discovery that most people are already involved in connecting with a group of believers, whether in their church, their community, or their social environment. The best thing for church leaders to do is equip these existing groups with Bible study material and enable the leader to teach them well. Allen shares how church leaders can leverage existing relationships in a way that leads to more groups and to more people getting involved in groups. In addition, Brian and Chris discuss a blog post by Michael Kelley titled Laying the Cultural Foundations of Your Church and the necessity of a church culture that develops small group leaders who can effectively disciple small group members. GUEST: Allen White has devoted the last 25+ years to helping people find Christ, make meaningful connections, grow in their faith, and find fulfillment in ministry. He has successfully launched hundreds of groups at two churches as the Associate Pastor: New Life Christian Center, Turlock, California, for 15 years and Brookwood Church, Simpsonville, South Carolina, for 4 years. Additionally, in his work with Brett Eastman and Lifetogether, Allen has had the privilege of coaching hundreds of churches of all sizes and denominations over the last 10 years. He has taught workshops for local churches as well as speaking at the Purpose Driven Church Conference at Saddleback Church, the BASS Church Workers Convention, the Willow Creek Association–Canada, and many others. Allen earned a B.A. in Biblical Studies and Missions and an M.Div. in Christian Education. Allen, his wife Tiffany, and their four children live in Greenville, South Carolina. Find more information from Allen at allenwhite.org at on Twitter: @allenwhite.